His visit falls on the same day as the funeral for 10-year-old Taylor Thornton. President Donald Trump traveled to Alabama Friday to survey areas devastated by deadly tornadoes earlier in the week. The president and first lady Melania Trump toured part of a devastated neighborhood and visited with families who had lost loved ones, visited a church that has been transformed into a disaster relief center -- and stopped to sign Bibles given them by victims. 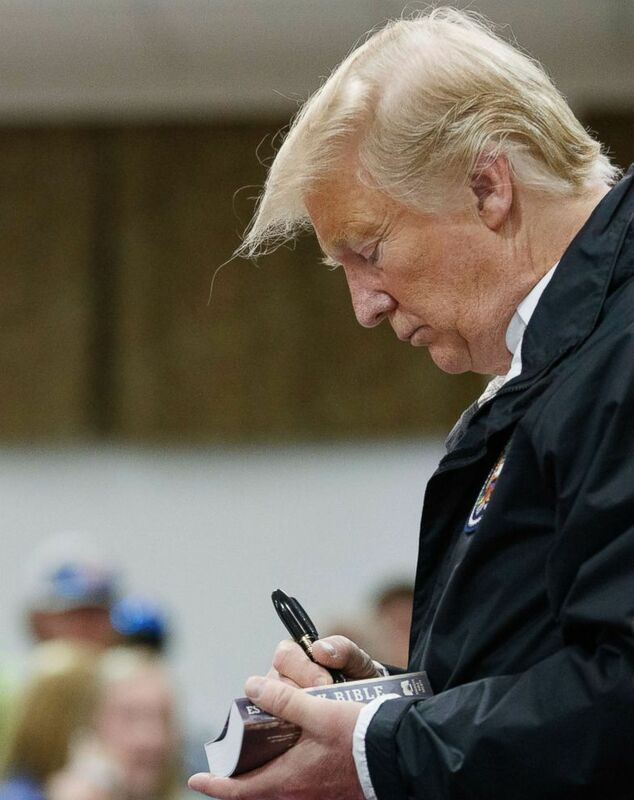 (Carolyn Kaster/AP) President Donald Trump signs a Bible as he greets people at Providence Baptist Church in Smiths Station, Ala., as he tours areas where tornadoes killed 23 people in Lee County, Ala., Friday, March 8, 2019. The Trumps also took an aerial tour of the destruction and paid their respects at a memorial for the lives lost. Holding hands, the president and first lady walked down a row of 23 white crosses, each of which represented a life lost, and paused before each one. Each cross had the name of a victim and was surrounded by stuffed animals. The president said he saw "things you wouldn’t believe" during his aerial tour and praised the work of state and local leaders, first responders, and FEMA. His motorcade at one point passed through entire neighborhoods that have been wiped away in the tornado, according to the reporters traveling with the president. (Nicholas Kamm/AFP/Getty Images) President Donald Trump greets residents in Opelika, Ala., March 8, 2019. “FEMA has been told directly by me to give the A Plus treatment to the Great State of Alabama and the wonderful people who have been so devastated by the Tornadoes,” the president said in a tweet earlier this week. The small rural community of Beauregard was flattened when two tornadoes ripped through it, leaving behind a trail of catastrophic damage. Those killed lived in roughly a one-square-mile area of the town, according to authorities. “The word catastrophic completely describes it … There are so many places where there is absolutely nothing – no standing structure. The power of this storm was amazing,” Capt. Bobby Kilgore of Opelika Police Department said. Beauregard residents living at the center of destruction said they hoped the president’s visit will bring more resources to the area. “I just hope he can bring some positivity to the area that’s what we need – bring help… We need the help. There’s people who are helpless,” James Stinson, a Beauregard resident said. Stinson and his family hunkered down to ride out Sunday’s deadly tornadoes. He says although his family was able to make it out alive— search and rescue crews found one of his neighbors dead on his property. Those who survived are now combing through the debris, the first step in a long road to recovery. “With the president’s help, we can get there. We’re trying to stay Beauregard strong,” Stinson said. 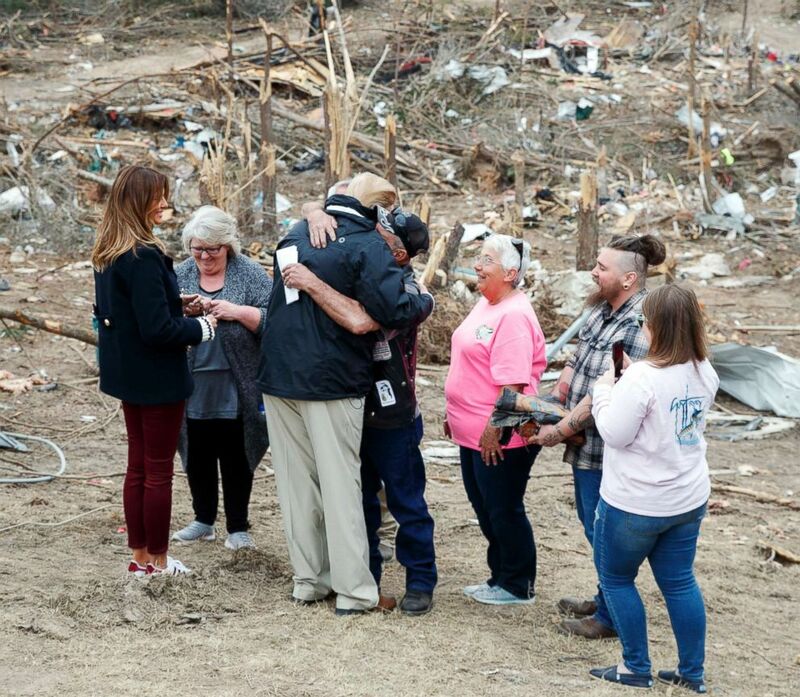 (Carolyn Kaster/AP) President Donald Trump hugs a resident as he and first lady Melania Trump talk with people in Beauregard, Ala., as they travel to tour areas where tornadoes killed 23 people in Lee County, Ala., March 8, 2019. President Trump approved a disaster declaration for the state on Tuesday, ordering federal aid to supplement State and local recovery efforts in the affected communities. “Assistance can include grants for temporary housing and home repairs, low-cost loans to cover uninsured property losses, and other programs to help individuals and business owners recover from the effects of the disaster,” the White House said in a press release. The president’s visit fell on the same day as the funeral for 10-year-old Taylor Thornton, who was visiting her best friend when the storm came through. Her friend was the only survivor at the home. 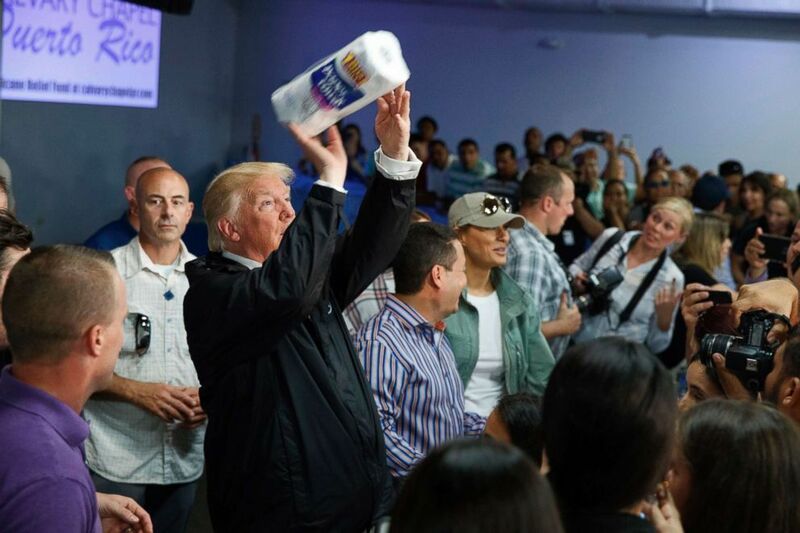 (Evan Vucci/AP) President Donald Trump tosses paper towels into a crowd as he hands out supplies at Calvary Chapel, Oct. 3, 2017, in Guaynabo, Puerto Rico. 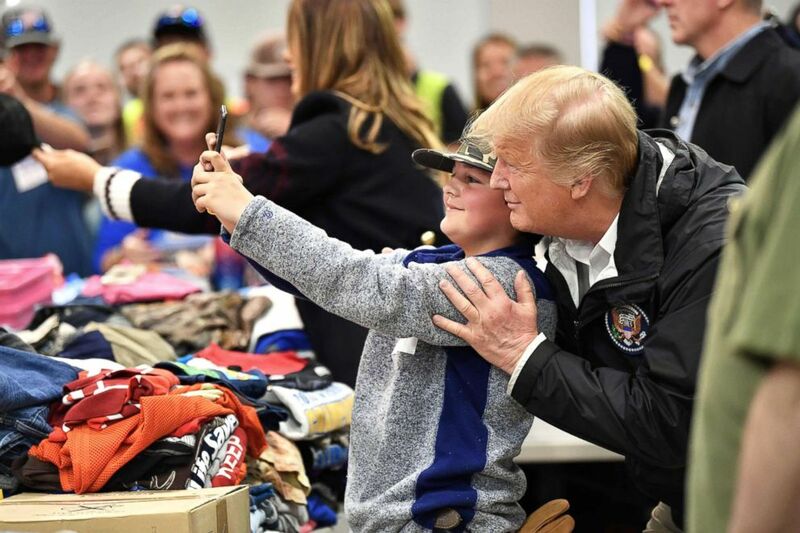 President Trump has traveled to meet with victims of several natural disasters while in office including the areas devastated by the California wildfires, Hurricane Michael, Hurricane Florence and Hurricane Harvey. Some of his visits to destroyed areas have drawn criticism. San Juan Mayor Carmen Yulin Cruz denounced Trump's visit to Puerto Rico as a public relations stunt and criticized how he handed out supplies at Calvary Chapel after he tossed paper towels into the crowd. "His terrible and abominable view of him throwing paper towels and throwing provisions at people, it's really – it does not embody the spirit of the American nation," Cruz said in an interview with MSNBC in October.